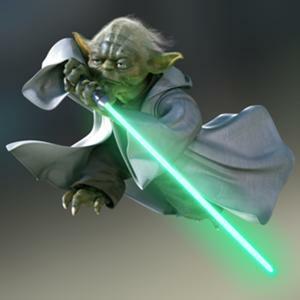 If you are a fundraiser and have been active on twitter, you likely have come across the new master fundraiser, FundraisingYoda. He has a CFRJ (Certified Fund Raising Jedi) and lots of wisdom to share. I asked Fundraising Yoda for his time so I might seek answers to questions I had. He graciously obliged. Below is excellent advice for fundraisers – or anyone working professionally and building relationships. FundraiserBeth: People come to a fundraising career from different paths… how did you move from training Jedi to becoming a fundraiser? FundraisingYoda: Too commercialized, training Jedi, was becoming, and no longer meaningful for Yoda. Had become all about the glory and money, it did. Self-aware, Yoda is, and knew change was needed. Ran charity gala on Sullust for victims of volcanic activity, and renewed sense of purpose, Yoda felt. Beth: What skills do you think are most transferable from Jedi to Fundraiser? Yoda: Patience. Determination. Strength. Vulnerability. Courage. Passion. Vision. Justice. Integrity. Being helpful. All traits of great Jedi and fundraisers alike, these are. 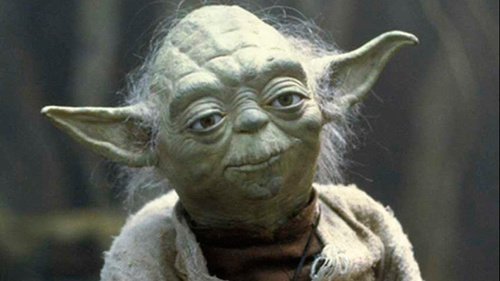 Yoda: Thinks Yoda, that in competitive market we are in, best will rise to top quickly and change the game, they will. Those that are committed not, fully, will be passed over and chance will be given to those that are. Those starting on their journeys, however, always room for them, there is. Experience, comes only with experiencing. Support, we must, the process of getting wet, their feet. Being reckless and making early mistakes can teach you much in the way of control. Both Luke and O.W. learned much this way. Beth: What advice do you have for Younglings and those just starting in the profession of fundraising, whatever their ages? Yoda: Keep those surrounded by light nearby, you must. Guide you on the right path, they will. Find other fundraisers or great leaders, who are where you want to be, and shadow them, you should. Entitled, you are, to nothing but a chance. Work, you must, for everything. As credibility continues to grow for fundraising field, competition will grow too, yes. Your integrity, let no one take it or alter it. If reputation, you have, for being deceptive fundraiser, using the force to alter minds instead of to win hearts, shake these demons, you may not be able to. Beth: As a Jedi trainer, you warned against the path of anger and the lure of the dark side. These are good pieces of wisdom for fundraisers. What must we most carefully guard against? What do you think brings us to the path of anger? Yoda: Guard against temptation for quick wins, yes. Expensive, they can be, in long term. You may ask for second gift in same communication as thank you, and work, it may seem, initially. In long term, appear greedy, you will. Easy, nothing comes. At least that which is worthwhile. Comes, anger, from not understanding others or trying to change what is under not, our control. Ask many questions with open mind, and understand your sphere of influence, you must. What is under your control, young Jedi, is how you behave and conduct yourself. Act well, in interest and service of donors, volunteers and colleagues, and just a memory, anger will be, when success continues to flow into your world, and the dark side is galaxies away. Beth: How do you keep up “work-life balance” since you are about 1,000 years old? Is that of concern to you? Yoda: No such thing as work-life balance, there is, believes Yoda. If right work, you are in, then work is part of life. Loving what you do is best path to fulfillment and balance. Stress, another issue, that is. Tough, fundraising is. Many grey hairs, Yoda has. Do things to recharge, or be doomed to collapse. Enjoys occasional summer on Tatooine, Yoda does. Beth: There has been much discussion about the fundraising profession being “broken.” Would you weigh in on this? If you believe there are problems, what are your words of advice? Yoda: Never, has Yoda been, a pessimist. Strong word, broken is. Needs some rejuvenation, maybe. Stand up, we must all, for our profession and uphold morals and principles of ethical and progressive fundraising. Then just fine, we will be. Every action we take, defines us, it does. Before taking action, think, you must of how this will look on you, but also the field of fundraising. Beth: You have traveled quite widely in your time. Do you still travel when asking for gifts or spreading wisdom? Yoda: Energetic, as he once was, Yoda isn’t. Travelling less, I am. Twitter and Skype, much they have helped with networking. For donors, Yoda will travel wherever they need me, yes. Easy for them, we must make it. Beth: I read that you were able to win battles by lifting the morale of thousands of companions while simultaneously dampening the spirits of thousands of opponents, using a valued Force technique called Battle Meditation. Do you think Twitter and Battle Meditation have anything in common? Yoda: Has the power, Twitter, to influence many. Can be used to raise morale or pull others down. Difference is that, for Yoda, Twitter is best used for the the former, only. Not best used as a medium for dampening spirits of others. Beth: You have been very complimentary of your followers. Do you think this will make a “fundraising force” for good? Yoda: Without followers, exists not, Yoda. Period. Powerful tool, gratitude is. Believes not, Yoda, that it can be overdone. Hopes, Yoda does, to inspire others to use it more, in fundraising and life. Being grateful creates a foundation where alive, become our hope and dreams. Beth: Have you ever had occasion to meet any of the philanthropists of our world – Bill Gates or perhaps George Lucas? Yoda: Good guy, Bill is, and so is Warren. Generous, they are, with their amassed fortunes. If Yoda met George Lucas, it would be too profound, like circular reference in Excel spreadsheet, and chaos would occur. Beth: In the short time that you have been on Twitter, you have built a following and many are following your tweets with interest. Some are filled with gravitas and wisdom, some are funny! 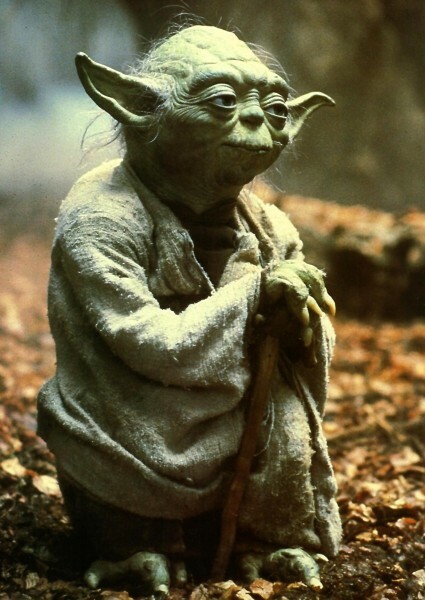 Tell me a story from your childhood that gives us insight to the Yoda you are now. Yoda: Childhood is vague and cloudy, but, one event, changed Yoda. Early in fundraising career, Yoda was working with “Save the Banthas“. Went in to donor meeting with no specific ask, no research done and no preparation. Ugly, it was. Forever changed Yoda. Almost went back to Dagobah. Beth: Within 24 hours after coming onto Twitter, you were off… there was a disturbance in the force. Were there too many characters from your past trying to follow you on twitter? Is that why Twitter shut you down? Yoda: Rapid rise got to Yoda, it did. Ended up, Yoda, next to Justin Bieber spitting off a balcony. Low time for Yoda, it was. Break, we both needed from public eye. Better, Yoda is now. Justin, not just yet. Beth: Are you able to tell us from what galaxy or world you are communicating? Yoda: Many have asked, yes. Disclose, Yoda will, that he is in your solar system for time being. Any more detail than that, ruin the magic of mystery, it might. Beth: What last thoughts would you like to leave with the readers? Yoda: Appreciates, Yoda does, immense support from fundraisers and others doing good. Living example, Yoda is, to take a risk, be creative and out there, put yourself, with good intentions. Applied to fundraising, magic can happen. Important role it is, take it seriously, you must. But fun, you must also have. Beth: It seems that with your understanding that affinity with nature enhances an affinity with the Force, your interest in natural building materials and enjoyment of food foraging, Vancouver would be a perfect spot for a vacation! Any consideration for a visit? Yoda: Great place, it looks like, Vancouver. Next vacation for Yoda is 48th of Ma’akarnak in 4034. Visit then, can I? Beth: Dear Yoda, if I’m not here to host you I know there will be some other fantastic fundraisers who will jump at the chance! Yes! I want joy sailing through my inbox! Accomplish anything with grit, grace + gratitude. Navigate a successful career + balance your personal life. Create deeper relationships between supporters + your nonprofit. Understand how to work with high net-worth supporters. Love this, Beth. And you, for doing it. Is fundraising in Africa under Yodas vision?Poorly developed and wonder what he has been doing all those years! Loved this Beth. Wise is Yoda, and you. Follow you both, I do. 🙂 Wise and wonderful and obtuse, is he; gave up trying to see his face!! Somehow, I missed this one. Thank goodness for Twitter! This was a fun read. It was fun (and tricky) to do. Glad you had a smile from it! For me, fundraising is a calling. I enjoy everything about being a fundraiser. Working with a team, working with donors, finding connections, building trust, and welcoming the heartfelt gifts of donors inspires me.